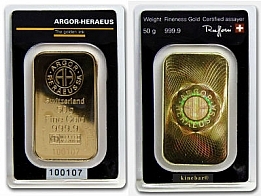 Argor Heraeus 5 Gram Kinebar Gold Bullion Bar 999.9 Fine. 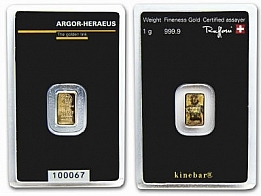 Argor Heraeus Kinbars feature the Argor Heraeus logo, with the weight, fineness and serial number below. Each bar comes in a plastic certicard with a serial number and a hologram on the back of the bar to confirm its authenticity. The Kinebar, or hologram design, is a special technology developed by Argor Heraeus that uses a laser to inscribe a hologram design on the back of a gold bar. The design cannot be replicated, and therefore, it helps to ensure the authenticity of the bar. Argor Heraeus Kinebars are available in sizes ranging from 1 gram up to 100 grams. For larger sized bars, the traditional Argor Heraeus series is available. 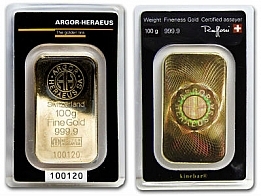 Argor Heraeus bars are also available to bullion investors in platinum, palladium and silver. However, the kinebar design is only available in gold bullion. 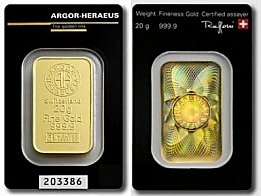 Argor Heraeus bullion is popular with individuals looking to invest in gold bars.